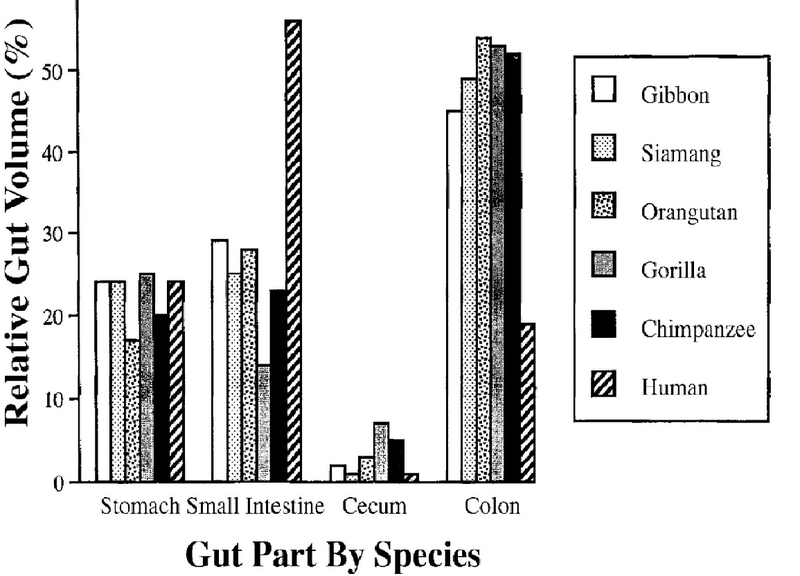 Above: The human digestive system is significantly different from those of primates that share a high percentage of DNA. Compared to our nearest relatives, the area of small intestine, which absorps meat with high efficiency, is large; the colon, the organ best suited to digest (ferment) vegetation, is small by contrast. Here you see an assortment of stomachs, including the stomachs of omnivores (rat and pig). Which two stomachs are most alike in distribution of gastric mucosa? Hint: It's not omnivores (pig, rat) and humans. The stomachs most alike in this diagram are the stomachs of dogs and humans. 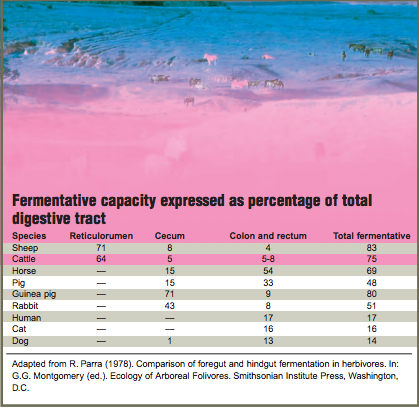 This graphic demonstrates fermentative capacity (the ability to digest plant based foods) of several animals. Notice that the fermentative capacity for the omnivore pig is 48, while humans, cats and dogs range from 17-14. The take home message: The human digestive system differs greatly from our nearest relatives, the great apes. It is a far cry from even the omnivore chimpanzee, thought to share at least 70% of DNA with us. In terms of our ability to digest vegetation (our fermentative capacity) the human is on par with cats and dogs. 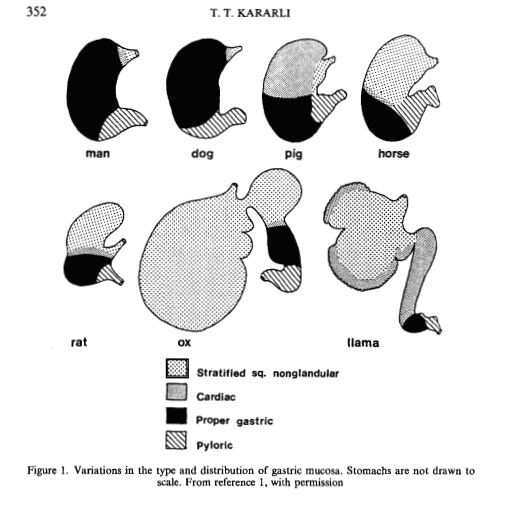 The human stomach is nearly identical to the dog's, and very different from the two featured omnivores (rat and pig). What does this mean for us? For our dietary requirements? If vegetables are not cooked, fermented ("pickled", soured, e.g. ), processed, pureed, juiced or bred for tenderness can humans digest them? Not well. However, in my studies while I learned we don't digest unprocessed and wild vegetation well (it's difficult for us to break down cellulose) I did not conclude humans should avoid vegetation. Our ability to adapt foods to our digestive systems allowed us to migrate all over the world, finding nourishment in all matter of climates and environments, and in every season. We are able to prepare and/or breed plant matter to suit our digestive systems, unlike other animals that eat plants directly with no prep work or plant breeding required. Our carnivory was essential to survival, well suited to harsh winters, cold climates and other areas where animals were available, while plants were scarce, unavailable or undesirable. Politics and popular books aside, are humans really omnivores? Thank you for reading and considering this post.